If you are considering opening an art gallery or -you already did! 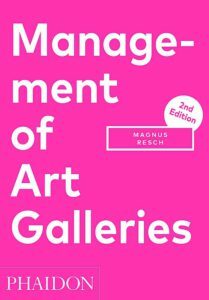 You shouldn’t let another day pass by without reading Magnus Resch’s Management of Art Galleries. Gallery team members as well as those curious on the matter included, of course; this brilliant, well-researched, amusing book is a true eye opener for anyone in the business. “The art world is tough, the rules are a mystery, and only the lucky few make money’ – so how can galleries succeed? What makes a commercial art gallery successful? How do galleries get their marketing right? Which potential customer group is the most attractive? How best should galleries approach new markets while still serving their existing audiences? Based on the results of an anonymous survey sent to 8,000 art dealers in the US, UK, and Germany, Magnus Resch’s insightful examination of the business of selling art is a compelling read that is both aspirational and practical in its approach (2016, Phaidon Press).